A political analyst tells Press TV that almost every single family in Gaza has lost somebody throughout the years of Israeli attacks, oppression and occupation and yet nothing is done and there is no justice. The comments come after a 13-year-old boy was killed by Israeli gunfire in the southern Gaza Strip. Press TV has conducted an interview with Adie Mormech, human rights activist, to further discuss the issue. What follows is an approximate transcription of the interview. Press TV: As if this five year old maritime and land blockade is not enough which is suffocating the people there in the Gaza Strip. Here we have this death that has occurred along with what is going on in the occupied West Bank regarding Israel. Tell us your account of what occurred and of course, how the situation keeps looking grim for the people in the Gaza Strip? Mormech: Well this is an Israeli incursion. I mean the Israelis describe this is a routine operation which is basically saying that they can come into Gaza whenever they want, they destroy the field of the farmers, they destroy the livelihoods of many of the farmers in the area, they terrorize neighborhoods, they attack villages and very often they end up killing a civilian like this and this was another child. 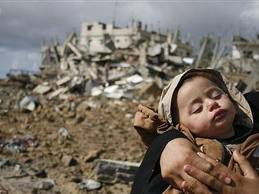 How many children in Gaza need to die before the world takes note and says right, okay Israel you cannot just keep committing murder against what is a population the majority are children. And you see the families just wish for once the West would understand what these families are going through. Every single family almost in Gaza has lost somebody or lost somebody who was close to them throughout the years and years of these attacks, oppression, occupation and of course initially this ethnic cleansing of Palestinians. Most of the Palestinians in Gaza are refugees. Have they not suffered enough to have to go on living like this in the world's largest open air prison whereby they are regularly attacked through the borders, regularly attacked from the skies with the F-16 and the drones that you can hear over their head right now and regularly hit by the gunships who are attacking the fishermen every day. This is another child that has been caught up in the gunfire and many Israelis have admitted that they have killed children and yet nothing is done. There is no justice whatsoever. In fact the people who attacked the Samouni family during the attacks on Gaza in 2008-2009 killing 29 people, the 21 people with one bomb, that crime was well-documented by every single legal witness and framework that was going and yet they found the Israeli soldiers to be not guilty. So we will see no justice whatsoever for this child, we will see no justice for the families but what we will see is the mother and the father and the families and the wider families crying every single day for the loss of their child on top of the fact that they cannot live no more lives in the border areas anyway because all that farmland is being taken away by the Israeli attacks that does not allow them to access it. These are crimes, this is a horrific crime and really it is time for people to stand up and say no more and that includes people on the ground whereby movement is happening and especially making sure that finally they pushed the governments to say we have had enough of this, this is murder and there is blood on Israel's hands yet again tonight.